Rhubarb is one of those foods that are made for pairing. By itself it seems like some strange red cousin of celery, but as soon as it's baking with strawberries it somehow takes their incredible flavor and smell to an entirely different level. That's why I wanted to keep this little dish as simple as possible. The pairing is so great you really don't need a complicated topping to make it amazing, although It pretty much screams for a big scoop of vanilla ice cream! Combine strawberries, rhubarb, sugar, cornstarch and lemon zest in a bowl and let sit for 30 minutes. In a seperate bowl combine all remaining ingredients except honey. Mix until butter is crumbly, add in honey and mix well until combined. 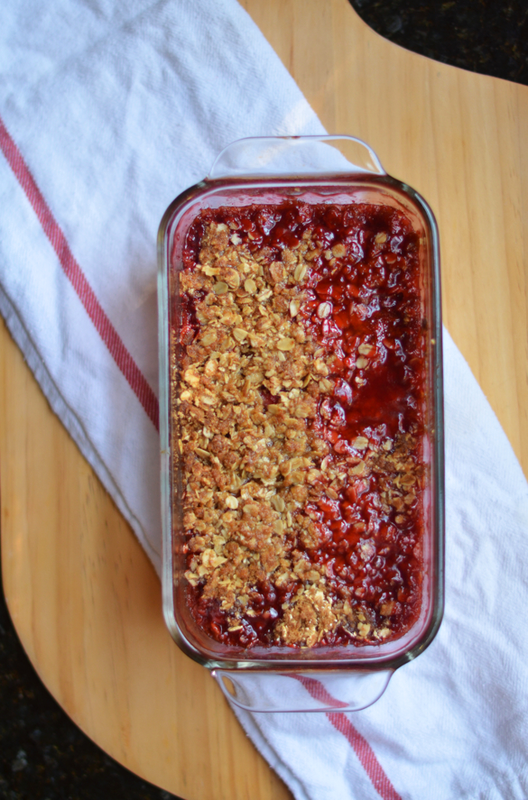 Grease a 8.5x4.5 baking dish, pour in strawberry mixture and top with crumb mixture. Bake at 375F for 15-20 minutes until fruit is bubbling and topping is crisp and browned. Allow to cool until fruit is set.